Searching For Senior Care & Housing? We offer guidance to help you locate your loved one's best options. A PLAN FOR SENIOR CARE, Inc. provides information for those seeking options for retirement living, senior apartments, assisted living facilities, residential board and care homes, secured memory care facilities, skilled nursing facilities, and home care. Based on the care needs, budget, and geographical constraints presented by the responsible party, an appropriate list of licensed facilities and or agencies is given. A PLAN FOR SENIOR CARE, Inc. only represents facilities and agencies that are licensed by the state in which they operate. Our company does not operate or hold any ownership in any of the facilities or agencies that it includes in a referral to the responsible party. We are unbiased and will not recommend or endorse any of the facilities or agencies, but we will help the responsible party exercise its own ability to choose an option responsibly. We urge you to conduct a thorough and independent assessment of referred Facilities and/or Agencies by touring Facilities, interviewing owners and staff members of Facilities and/or Agencies, speaking with residents or clients and their family members and contacting State licensing and the Ombudsman regarding any complaints or reported deficiencies with Facilities and/or Agencies. The responsible party is entirely responsible for their choice. ​A PLAN FOR SENIOR CARE, Inc. is not a party to, nor do we prepare, review or negotiate any contract or agreement entered into between you and a Facility and/or Agency. 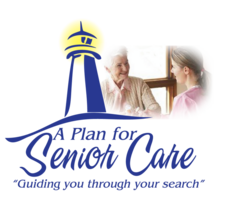 So that A PLAN FOR SENIOR CARE, Inc. can offer information for free to the responsible party, we collect a fee from the licensed facilities and agencies that we represent. Facilities and Agencies are prohibited from charging more to referred individuals, and no part of our fees may be apportioned to you. A Plan For Senior Care does not solicit, receive or accept gifts or referral incentives from participating Facilities and Agencies. A PLAN FOR SENIOR CARE, Inc. may provide you with referrals for additional professional service providers, such as elder law attorneys, Veteran’s advocates, financial advisors, realtors and accountants to assist you with developing a comprehensive care plan. We do not solicit, receive or accept fees, gifts or referral incentives from referred professional service providers.